Local sources disclosed on Sunday that several terrorists, who had been wounded in the battle with the Syrian government forces in Quneitra province, have been taken to an Israeli hospital. The sources reported that a number of injured members of Al-Nusra Front (also known as Fatah al-Sham Front or the Levant Liberation Board) have been transferred to the Israeli hospitals via al-Hamidiyeh region in Quneitra countryside. The army troops repelled Al-Nusra Front’s offensives in the Southwestern province of Quneitra, leaving tens of terrorists dead and many more wounded. Later, the Israeli aircraft attacked the Syrian government forces’ tanks and artillery positions South-West of the war-hit country. 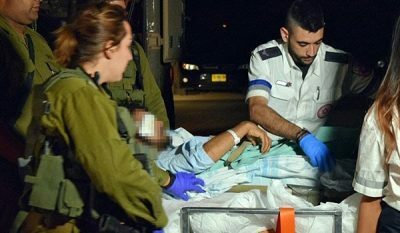 This is not the first time that Al-Nusra terrorists have been transferred to Israeli hospital after sustaining injuries in clashes with the army soldiers. In September and November 2016, tens of wounded fighters of Fatah al-Sham (formerly know as the Al-Nusra) Front were transferred from Quneitra battlefields to Israeli hospitals in the occupied Golan Heights, as several Israeli ambulances entered Syria’s Southern province of Quneitra and transferred those terrorists injured in clashes with Syrian Army troops to their hospitals in the occupied part of the Golan Heights. Also, scores of fighters of Fatah al-Sham succumbed to their injuries in Israeli hospitals and their bodies were handed over to the Takfiri terrorists in Syria’s Quneitra. Fatah al-Sham received these bodies and transferred them to its own field-hospital in the village of Jabata al-Khashab near Quneitra city. In October, sources disclosed that Fatah al-Sham Front dispatched its wounded members to Israeli and Jordanian Hospitals via Syria’s Southern borders.